Rescue workers find 19 more survivors in the rubble today as the death toll rises to 340. SAVAR, Bangladesh — Police in Bangladesh took five people into custody in connection with the collapse of a shoddily-constructed building this week, as rescue workers pulled 19 survivors out of the rubble on Saturday and vowed to continue as long as necessary to find others despite fading hopes. 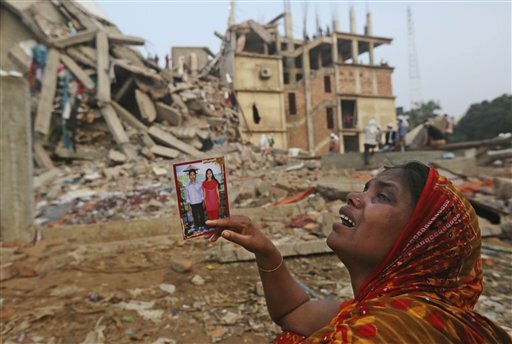 A Bangladeshi woman weeps as she holds a picture of herself and her missing husband while she waits near the site of the building collapse. 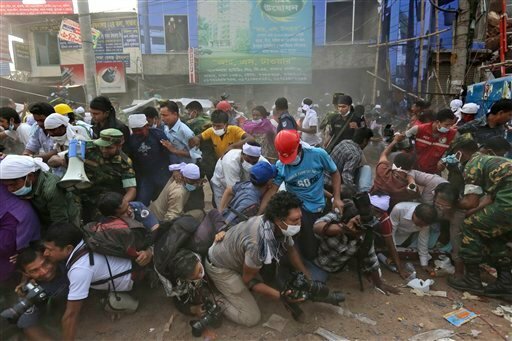 Bangladeshi rescue workers and media fall on top of each other in a stampede aftersomeone shouted that a section of building might collapse in Savar, Bangladesh, on Friday. At least 340 people are known to have died, crushed by massive blocks of concrete and mortar falling on them when the 8-story structure came down on Wednesday morning — a time many of the garment factories in the building were packed with workers. It was the worst tragedy to hit Bangladesh’s massive garment industry, and focused attention on the poor working conditions of the employees who toil for $38 a month to produce clothing for top international brands. Among those taken into custody is the wife of the building owner, who is on the run, in an attempt to force him to surrender. Violent public protests continued sporadically in Dhaka and spread to the southeastern city of Chittagong where several vehicles were set on fire. “There are many (survivors) still there,” Subrata Sarker, a fire official, told The Associated Press, taking a break after emerging from the debris. Around him, soldiers, police and medical workers in lab coats worked in frenzied activity. Rescuers passed bottles of water and small cylinders of oxygen up a ladder leaning against the side of the building to be given to possible survivors inside. Nearby, Abul Basar wept as he awaited news of his wife, who worked in one of the garment factories. “My son says that his mother will come back some day, she must return, ” he cried. Rescue teams went in from seven entry points gouged into the rubble. Every once in a while a badly decomposed body would be brought out, covered in cloth and plastic, to a spot where ambulances were parked. Workers furiously sprayed air-fresheners on the bodies to cover the stench, leaving the air thick with the smell of death and cheap perfume. The death toll is expected to rise as big portion of the crumbled building was still untouched and heavy equipment would be needed to remove the debris to recover the bodies. Junior local government minister Jahangir Kabir Nanak put the death toll at 340. Military spokesman Shahinul Islam said 2,419 survivors were accounted for, including 19 who were pulled out Saturday. “We will continue our operation for more survivors as long as it is required. We are not thinking of wrapping up of our effort any time soon,” he said. Police in riot gear formed a cordon around the site to keep away hundreds of protesters who have been venting their anger at the situation since Wednesday. Authorities shut down garment factories in Dhaka for fear of violence, which has persisted over demands that police arrest the owners of the factories and the building. Junior Home Minister Shamsul Haque Tuku said police had arrested Bazlus Samad, managing director of New Wave Apparels Ltd., and Mahmudur Rahman Tapash, the company chairman. He told reporters that police had also detained the wife of Mohammed Sohel Rana, the owner of the collapsed Rana Plaza building, for questioning. The top three floors of the eight-story building were illegally constructed. Authorities are still searching for Rana, a local politician, who hasn’t been seen publicly since the building collapsed. Negligence cases have been filed against him. Police in Bangladesh often detain relatives of missing suspects as a way to pressure them to surrender. Dhaka Police Superintendent Habibur Rahman said Rana was a local leader of ruling Awami League’s youth front. His arrest, and that of the factory owners, was ordered by Prime Minister Sheikh Hasina, who is also the Awami League leader. There were fears that even if unhurt, the survivors could be badly dehydrated, with daytime temperatures soaring to 35 degrees Celsius (95 degrees Fahrenheit) and about 24 degrees Celsius (75 degrees Fahrenheit) overnight. A brief thundershower accompanied by lightening slowed down rescue efforts on Saturday. With hammers, handheld concrete cutters and drills, rescuers and volunteers – some wearing helmets and other safety gear but many not – chipped away at a large slab of concrete, brick and steel rods that was once a factory floor. An excavator moved in to finish the job, dragging away and lifting up the debris. Other rescuers used their hands or shovels, passing chunks of brick and concrete down a human chain away from the collapsed structure. On the ground, mixed in the debris were several pairs of pink cotton pants, a mud-covered navy blue sock and a pile of green uncut fabric. A garment manufacturers’ group said the factories in the building employed 3,122 workers, but it was not clear how many were inside it when it collapsed. The disaster is the worst ever for the country’s booming and powerful garment industry, surpassing a fire five months ago that killed 112 people and brought widespread pledges to improve worker-safety standards. Since then, very little has changed in Bangladesh where low wages have made it a magnet for numerous global brands. Bangladesh’s garment industry was the third largest in the world in 2011, after China and Italy, having grown rapidly in the past decade. The country’s minimum wage is the equivalent of about $38 a month. 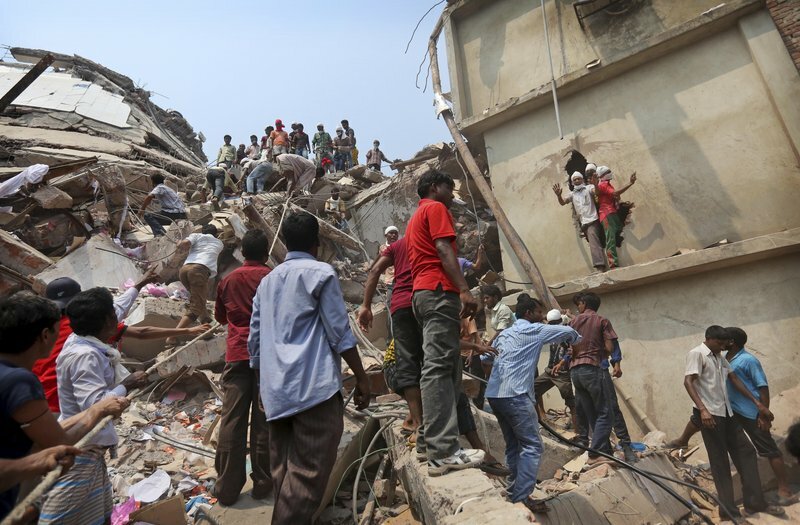 Britain’s Primark acknowledged it was using a factory in Rana Plaza, but many other retailers distanced themselves from the disaster, saying they were not involved with the factories at the time of the collapse or had not recently ordered garments from them.